This is the first game in the Pocky & Rocky series. For other games in the series see the Pocky & Rocky category. For the Famicom Disk System version, see KiKi KaiKai: Dotou Hen. 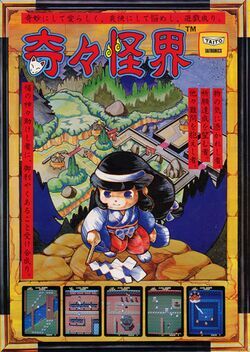 KiKi KaiKai (奇々怪界, Kikikaikai?, Mysterious Ghost World) is a multi-directional shooter developed and published by Taito Corporation originally for Japanese arcades in 1986. Since then, the game has received a number of console and home computer ports in and outside of Japan, both as a stand-alone title and as part of compilations. The game originally saw a limited release in North American and European arcades as Knight Boy, a bootleg copy of the original Japanese version not officially licensed by Taito. In the English-speaking world, it is usually recognized as the forerunner to the Pocky & Rocky series. Set in Feudal Japan, the player must assume the role of a Shinto shrine maiden named "Sayo-chan" who must use her o-fuda scrolls and ohari Gohei wand to defeat a number of renegade spirits and monsters from Japanese mythology. The game is noteworthy for using a traditional fantasy setting in a genre otherwise filled with science fiction motifs. The game follows the adventures of "Sayo-chan", a young Shinto shrine maiden living in Feudal Japan. One night, while Sayo-chan is fanning a ceremonial fire, she is visited by the Seven Lucky Gods, who warn her of a great, impending danger. Suddenly, a band of mischievous goblins appear and kidnap the gods, quickly retreating to a faraway mountain range. Sayo-chan, determined to help the gods, sets off on a journey across the countryside, where she confronts a number of strange creatures from Japanese mythology, including yokai, obake, and yurei-like monsters. After defeating several powerful goblin leaders, Sayo must battle their leader, the ancient serpent Orochi. Cover art for the TurboGrafx-16. Cover art for the MSX. This page was last edited on 28 August 2016, at 12:35.